One of the problems with currencies is that their relative value changes all the time. Thus the 10,000 Nakfa stashed into your Eritrean bank account which were worth $1,100, suddenly become worth just $1,020. MoneyWorks handles this by allowing you to change the system exchange rate at any time (and also to specify a transaction rate for individual transactions if you need to). A separate currency rate is held for each currency for each period. You can change the rate for any open (unlocked) period, but you should be circumspect about changing prior periods as it will generate currency gains/losses, which will affect your P&L. Exchange rates are always expressed in terms of how many units of the foreign currency will be purchased by one unit of the local currency. At this point a journal will be created to reflect the gain or loss that has occurred because of the rate change. Generally the change in value of the balance due on unpaid invoices in the currency will be posted to the Unrealised Gain/Loss account, and that of any bank accounts will be posted to the Realised Currency Gain/Loss account. Note: If you are changing the rate in a prior period, two journals will be created: the first is to journal in the currency gain/loss in the period of the change; the second is to reverse this out in the subsequent period. If you wonder why this is necessary, have a think about what would happen if we have entered the same rate for Jan and Feb, and then change the rate in Jan. 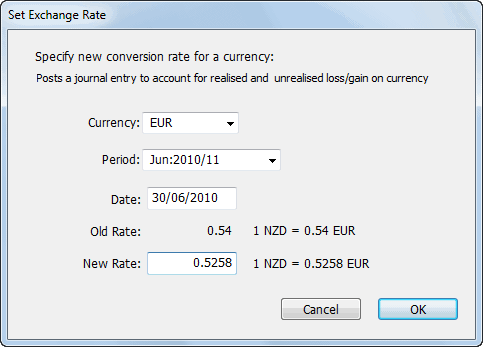 Tip: Use the exchange rate report to view historic rates (or customise the currency list to see them on screen).